A couple of weeks ago I mentioned how I had met my long lost second cousins and how we started talking about family history. I followed this up by digging up a memoir by my great aunt Della who died about 20 years ago. She grew up in Punta Arenas in Chile and described life there in the 1890s in vivid detail. I transcribed the South America section of her memoir and Duncan Campbell at the Patbrit (British Presence in Southern Patagonia) website has been extremely helpful and has uploaded it together with two letters that my grandfather Claude (Della’s brother) wrote from Punta Arenas aged about nine. A few days ago I went to meet my second cousins, one of whom I see every 10 to 20 years (this was only the third time I have met her in my adult life) and the other I had never met (except as a baby I believe). We talked mainly about family history, and among the things that came up were the fact that my grandfather – their uncle – had a sister who died as a baby when her parents were living in Punta Arenas, at the southern tip of Chile. Incidentally I have long been aware of a distant Argentine connection but hardly at all of a Chilean one. Anyhow, I looked up the names of my great grandparents on a well known search engine, and found to my amazement that their baby daughter is mentioned in a website devoted to The British Presence in Southern Patagonia. 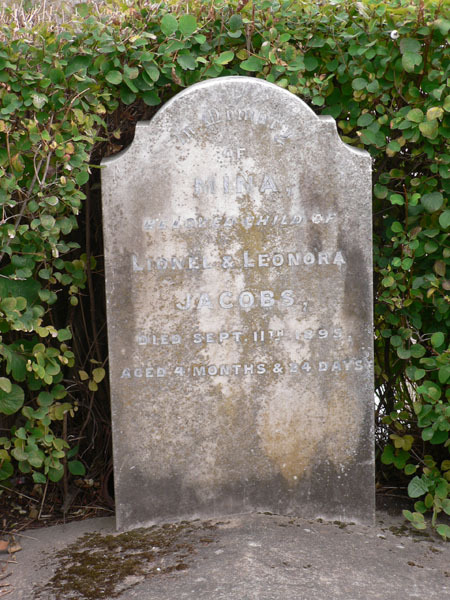 It features a list of all the British people buried in the municipal cemetery in Punta Arenas, including Mina Jacobs, born 11-IX-1895, died aged 4m + 24d and there is even a photograph of her grave. She had three brothers and one sister; her brother Claude was my grandfather. By a strange coincidence a colleague at work visited the cemetery a few weeks ago on a walking tour of Patagonia. She said it is very beautiful and one of the main sights of Punta Arenas (not the most attractive city in the world, I gather).